Arley Doc M > Doc M Close Coupled Pack With Low Lever Flush & Blue Rails. 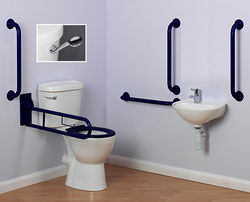 Complete Doc M close coupled toilet pack with low lever flush and blue grab rails. Specifically designed to meet the requirements of Building Regulations Document M.
Conveniently packed in one carton (1120 X 500 X 520, 50KG). 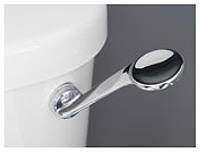 Doc M close coupled WC pan: W362 x D706 x H470. 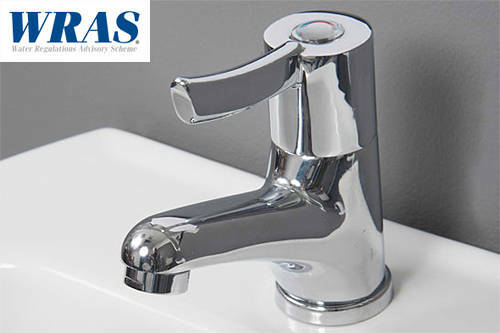 Doc M cistern with WRAS approved low lever fittings: W456 x D195 x H367. Doc M wash basin 1TH: W455 x D326 x H195. Doc M steel grab rails x 5: 600mm - W685 x D35 x H120. Doc M swing arm: W760 x D170 x H262. Doc M steel padded back rest: W485 x D306 x H145. Doc M mono basin mixer tap. Basin waste and bottle trap included. Tested and approved to BS EN 997:2012. The Arley range of Doc M products provides high quality and durability needed for a special needs bathroom.